My daughter has eczema and I have to be extremely careful about what kind of laundry detergent I use. Even free & clear detergents cause her to break out. 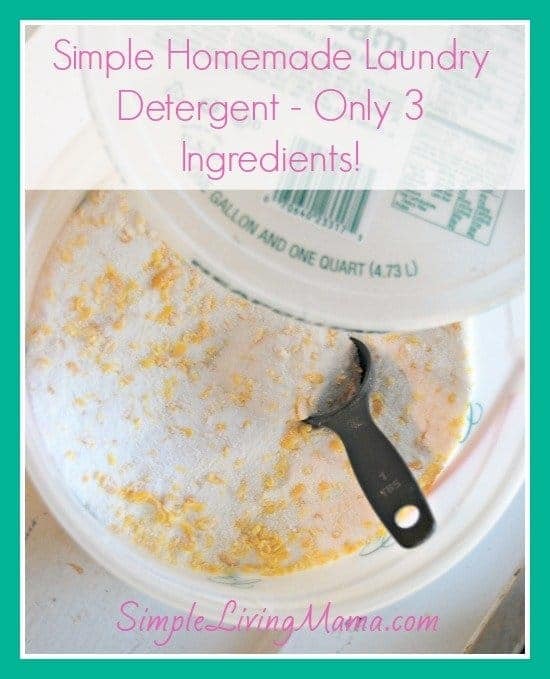 Enter this wonderful recipe for simple homemade laundry detergent. It only contains three ingredients and so far it is the only thing I can use to wash my daughter’s clothes. Now, I’m not saying this recipe will work for everyone. It works for us, and it is super cheap to make. Plus, the kids and I actually enjoy sitting around and grating the soap bars. They smell nice and, I don’t know, the grating is kind of therapeutic. Plus, there’s nothing better than making something useful with your own hands. This homemade laundry detergent recipe is almost the same recipe on my FREE Printable Homemade Cleaners Cheat Sheet, but I have a little secret. I obviously leave out the Purex crystals because they irritate my daughter’s skin, and I leave out the oxygen bleach. This saves me a few dollars and I use oxygen bleach on loads that I feel really need it. All you need to make this homemade laundry detergent is a box of Borax, a box of washing soda, and three bars of Fels-Naptha. We like to go outside because the washing soda and borax tend to fly a bit. Grate the bars of Fels-Naptha on a fine grater and combine all of the ingredients. I use a big mop bucket to mix it all up. Then, I’m super cheap so I store my laundry detergent in old ice cream buckets! Whatever works! I use 2 tablespoons per load of laundry. I have a regular old top loader, but I am told this recipe works in HE machines. Just use 1 tablespoon. Let me know if you give this detergent a try and how you like it! An easy powdered homemade laundry detergent using only three ingredients! Finely grate all three bars of Fels-Naptha. Mix all ingredients together in large container. Use 2 tablespoons per load in a regular machine, and 1 tablespoon per load in HE machines. Follow Joanie Boeckman (Simple Living Mama)’s board Homemaking on Pinterest. 5 stars. (My mobile wont let me select any stars) I’ve been using these three ingredients for about 5 years and love it. I usually use Ivory but just discovered Fels Naptha and really love the smell of it. Ivory makes it even cheaper!